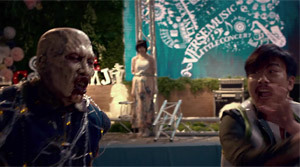 Story: One day Tim (Babyjohn Choi) is bitten by a vampire and he wakes up at his grandmother's again. 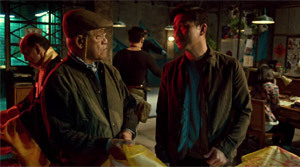 The two men Chau (Chin Siu-ho) and Chung (Richard Ng) have brought him there. Chau watches him very carefully since the two are actually vampire hunters disguised as street sweepers and he wonders why Tim doesn't transform. 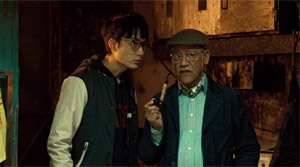 Chung explains to the young man that his parents actually have been vampire hunters as well and that both of them have been killed by a vampire. Tim's mother has been pregnant when she was bitten which is why Tim is immune. Despite initials doubts the young man eventually carries on his parents' legacy. But at first he needs to survive quite a bit of training. Furthermore, he meets female vampire Summer (Lin Min-chen) during one of the missions who he doesn't take out since she seems to be harmless. He takes her home with him where she more and more starts to behave like a normal human being. Tim wants to convince the Vampire Cleanup Department that there is also another way than simply killing vampires. But right now an especially powerful vampire is giving the department a hard time. Review: The hopping vampires are back! This reinterpretation of the "Mr. Vampire"-series from the 80s doesn't try to be more than it is and by doing so it could win over quite a few critics. Despite all the bowing down to the unusual horror comedy piece of the 80s you still shouldn't forget that you also have to look at this movie as a contemporary work. After all, "Vampire Cleanup Department" doesn't make use of Siri and the Scooter-Board without a reason, but aims at shifting the classic story around vampires and vampire hunters into our time. Yet, there remains a lot of cheesiness you know (and love) of 80s cinema. Since this was intended it gives the movie some special charm. But can you really excite the audience by simply tickling nostalgia? So let's stay critical and it should become apparent that the movie clearly lacks structure. This even goes so far that we have to ask ourselves, if the screenwriters actually deliberately tried to incoherently connect everything through chance hsppenings. The plot itself also is everything but original, including the immune vampire hunter, who doesn't have any supernatural powers, though, and the tragical background story of the parents who have died during a hunt. There are characters en masse, but they mostly remain surprisigingly shallow. That's particularly incomprehensible since it's easy to imagine that creating a familiar atmosphere between the vampire hunters was actually one of the screenwriters' goals. But they achieve to do so only partly and by no means in a satisfying manner. All in all, this is naturally supposed to be a love story. 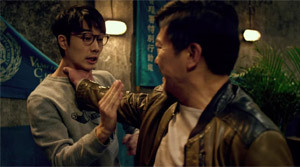 Babyjohn Choi (in small supporting roles to be seen in "Ip Man 3" among others) plays the inexperienced rookie who falls in love with a female vampire. Who is portrayed by Malaysian singer Lin Min-chen. It's also thanks to her that the love interest in fact becomes an important element in the movie. Her slow transformation to a human being is convincing and has a few cute moments. Just watching Lin dim-wittedly hopping around with stretched out arms is superb, particularly since she still manages to bestow some character upon her role as well. However, somewhere along the way the chemistry between Summer and Tim falls by the wayside. What's exactly the reason for that is hard to pinpoint. Probably, the lack of focus is the issue. After all, there is also the big, bad vampire. Still, most of the time he is of no importance to the events. He is only put there to be used during the finale and then it turns out that some more effort concerning the few action scenes there are would have been advisable. Tim's training by his uncle Chau - played by Chin Siu-ho, who also can be seen in a rather serious horror interpretation of the "Mr. Vampire" series called "Rigor Mortis" - could already be seen countless other times. Of course, sweeping with the broom is actually martial arts training, but even newcomers to Asian movies will know about this since the "Karate Kid"-remake with Jackie Chan. Naturally, a lot of this is supposed to be a homage to 80s cinema, but it doesn't always work out. The same can be said for some flat jokes. Contrary to that it also needs to be pointed out that other jokes hit the right note, though. Especially when the subgenre is poked fun at via new media. The special effects are never cheap, at times surprisigingly well done - therefore the vampires sometimes even look quite terrifying - but a certain kitsch-factor is intended and also works out fine. Unfortunately, the movie turns out to be shallow overall and has the dramaturgical structure of a semi-amateurish 80s production. At least concerning the script and the explanation for certain characters to show up at just the right location things could have been less capriciousness. As already stated, this unpolishedness, which is reflected by the finale and the ending, too, also constititutes the movie's charm. It's just the question how you approach such a picture as an audience. As a romantic horror flick there simply should have been more character development for the movie to really win us over. It sadly didn't succeed in doing so and thus there is some deduction in the rating despite the obvious charm factor.